Manchester United continue to be linked with a move for a number of attacking players this summer, following the departure of Zlatan Ibrahimovic in January and the expected sale of Anthony Martial. Given that Jose Mourinho didn’t settle on a right winger last season it wouldn’t surprise us if we sign a new player here before the start of the 2018-19 Premier League campaign. The latest forward to be linked to Old Trafford is controversial Eintracht Frankfurt and Croatian international Ante Rebic. 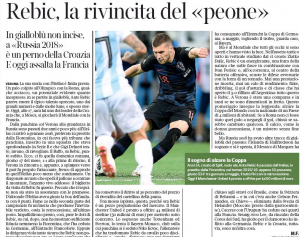 Rebic spent last season on loan at the surprise German DFL Pokal winners from Fiorentina and has been making a name for himself in Russia this summer. The 24-year-old was fortunate not to be red carded in games against both Argentina and England in this summer’s World Cup but is available to head coach Zlatko Dalic for today’s final against France. He has also committed the most fouls in this summer’s tournament. Ante Rebic has always struggled for goals during his career – failing to score for both RB Leipzig and Hellas Verona in loan deals where he made 10 league appearances for each club, and only eight in 49 appearances for Eintracht Frankfurt, despite starting the majority of those games up front. He has also been played out on both wings for club and country, where he has scored one goal in his five appearances for Croatia at this summer’s World Cup – a neat volley assisted by Argentina goalkeeper Willy Caballero. The rumours have only started in recent days so it’s hard to judge how serious our interest is. A couple of outlets have reoprted that we are interested and now Italian outlet Corriere di Verona claim that Manchester United are ‘ready to offer’ €50 million (£44m) for the ‘precious piece of the market’. We have certainly been linked with better players in recent weeks and with his below par goalscoring record and aggressive nature I’d be very surprised if Jose Mourinho makes any investment in Ante Rebic. I really like Rebic. I love his work rate and I think he could do well as a forward for Utd. Technically he isn’t the best but he’s a hard runner and he’s also deceptively quick. He’s well worth £44mil in today’s market.